Much to the disappointment and horror of my Mother, I had these done last week.. inspired by one of my favourite films, The Shining. I wanted a tattoo based on the Shining, and I saw SO many ‘Heeere’s Johnny’ tattoos that I thought I wanted something a bit different. So this is what I came up with. The image on top is how people would see it, saying Red Rum.. 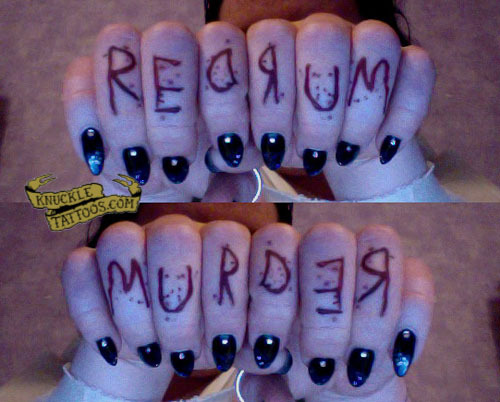 However because i only ever see it in mirrors, to me it says Murder.